The PS Vita isn't dead in Japan. Yet. Kidding! (Well, sorta.) Earlier today, the PS Vita's Japan-only price cut went into effect. Along with the cheaper portable, Senran Kagura: Shinovi Versus (and its limited edition pack) also went on sale. 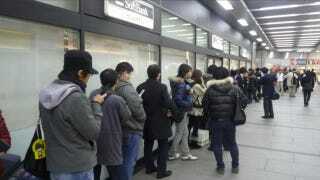 Thus, there was a line at the Yodobashi in Tokyo's Akihabara. Granted, this doesn't mean there was a line at every store in Tokyo, but there was one at this particular retailer. According to Inside Games, eventually about a hundred people lined up. So, if this proves anything, it's that cheaper hardware and ninja boobies will draw a line in Tokyo's geek district of Akihabara. Shocking!